An easy, damage-free way to hang fairy lights, bunting and other small, light decorations. 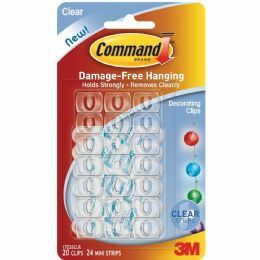 Command Clear Decorating Clips are tiny, clear plastic hooks that can be applied to almost any flat, clean surface including finished wood, tile, metal, glass and painted surfaces. Because the clips and adhesive strips are transparent, they’ll blend in perfectly with the underlying surface so that you can show off your decorations, not what’s holding them up! When the festivities are over and you want to take down or rearrange them, the clips are easily and cleanly removed without damaging the surface underneath – no cracks, holes, damaged plaster, sticky residue or stains. Want to use them for another party? Just reattach them using replacement Command Clear Adhesive Strips – each pack contains spares, and refill packs are available. Command Clear Decorating Clips are perfect for hanging fairy lights, party decorations, garlands and banners. Use them temporarily during a special celebration, or to create an all-year-round feature: Command strips will stay put for as long as you need them to. They are great for use in rented accommodation, schools or offices where you can’t put screws in the walls or are worried about marks and stains. They hold strongly on a whole range of surfaces but aren’t suitable for use on wallpapered surfaces or for hanging antiques or other valuable or irreplaceable items. When you want to take one down, hold the clip gently and pull the tab straight down, slowly stretching it until the strip releases from the wall. All of these instructions are detailed on the back of the pack.